Charlottesville students dig into the stories, told and untold, that make up their community’s history, and prepare to engage as citizens in the dialogue of the present. These last few years, a lot of history has been made in Charlottesville. This is true in the most obvious sense: the events of August 12, 2017 will be recorded in history books, perhaps as a key episode of our present era. But it’s also true in a more subtle, and more pervasive way. The history of Charlottesville, the way the community understands its past, and the stories it tells about itself, are in flux. Many of the region’s great historical sites—most notably Montpelier and the University of Virginia—are reevaluating which stories they tell, and which stories they don’t, undertaking years-long projects to learn more about the key role that slaves played in building and operating their respective sites, and crafting ways to tell those stories to the public. At the same time, through much of 2016 and 2017 an often contentious community-wide conversation, centered on the Robert E. Lee statue in the center of the city, put the place of the Confederacy and the Civil War in the community’s identity up for debate. Meanwhile, many of the region’s high school students sat in their history classrooms, engaging with the history of their community, region, and country mostly through textbooks. Angela Stokes and John Hobson at the Albemarle County Public Schools, along with a team of teachers from three of the district’s high schools, saw an opportunity. They saw a chance to take their students beyond the classroom and beyond history as a set of facts, to connect them to the history in the process of being made all around them, and to invite them to participate in that process. In May of 2017 they received an LRNG Innovators Challenge grant for the work, and the Let ‘Em Shine project was born. The project started with visits to a variety of monuments around the community and a study of their history and significance, focusing on the three layers of meaning contained in each one, explains Hobson. First, there is the history of the person or event being memorialized, itself a rich story. Second, each monument tells a story about the people who put it up, their values and priorities, and the cultural and political context of the time. Finally, as with the Lee statue controversy that inspired the project, how we react to monuments in the present can tell us a lot about our current context and historical understandings. Rather than simply passing by anonymous statues, students and teachers alike now have some understanding of the history being honored, and think “I wonder who put that up, I wonder why they put that up,” says Hobson. Students then participated in a variety of “field experiences,” travelling to sites such as Montpelier, the University of Virginia, and the state capitol in Richmond to meet with some of the experts and scholars rethinking the region’s history. These connections include Dr. Deborah McDowell, the director of UVA’s Carter G. Woodson Institute for African-American and African Studies, and the team spearheading “The Mere Distinction of Color,” a new exhibit at Montpelier telling the stories of those enslaved at the plantation. In the final phase of the project, armed with these new experiences and analytical tools, students have been invited to participate in this process of “telling a broader story” of their community by working in teams to identify and research an untold story, and memorializing it with a monument of their own. One group is working on a short film about the Daughters of Zion Cemetery, where many of the region’s prominent African-American residents were buried in the late 19th and early 20th centuries. Another group is painting a “Mural of Unity” to celebrate the diversity of their community, showing a side not reflected in national news coverage. One student wrote a song (sampling John Legend’s “Ordinary People”), and recorded it with members of the school’s band and choir. At the end of the school year the various projects will be showcased to the community, and many are already on display on the project’s website, built in partnership with a web design class at one of the high schools. The website also includes photo galleries, videos, podcasts, and teacher resources generated in the course of the project. The process of historical inquiry and design thinking involved in researching their untold stories and thinking about how to represent them to the community has proven far more interesting to students than the traditional history curriculum. As Stokes says: “student engagement increases when course content is applied to a real problem that matters to students and exists beyond the classroom walls. Let ‘Em Shine capitalizes on these transformational elements in two ways: by providing a problem that is both complex and relevant to students; and by maximizing student choice in how the problem is solved.” Hobson adds that the project “become something of an extracurricular” for many students, prompting engagement far beyond a usual school assignment. But Let ‘Em Shine isn’t relevant simply because it’s interesting to students—it is interesting because it is relevant. 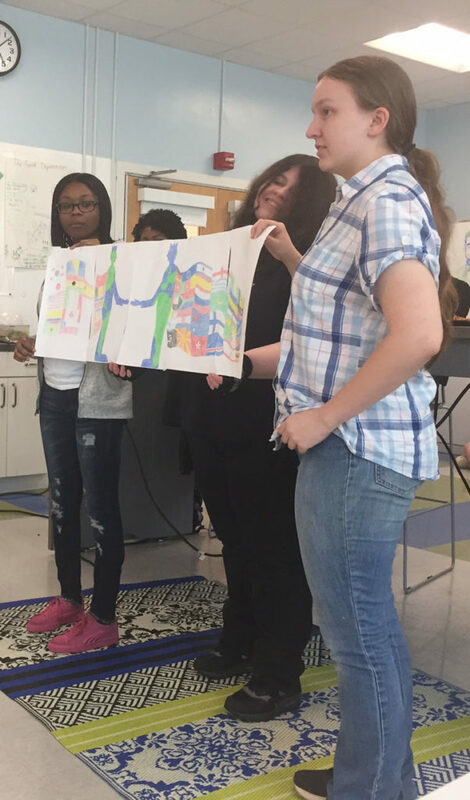 Students are engaged with the project because it gives them the ability to do something they couldn’t do before: engage with their community’s civic dialogue as adults and citizens, rather than as bystanders. “Students are feeling a little bit of efficacy when it comes to talking about these issues…[they] now feel like they can be part of the debate and the discourse around these things,” says Hobson. Thanks to the experience of Let ‘Em Shine, students now have something to contribute to the conversations that have been so prevalent over the last year: a body of knowledge about local monuments, a set of questions and inquiry skills for guiding critical conversations, and a story, one which has been left out, and can now be woven into the fabric of the community’s shared history. So in the spirit of connected learning, students’ passions have led them to become deeply engaged with academic content: local, regional, and US history, and a set of historical inquiry skills that will serve them well in a wide variety of contexts. They have worked in teams, developing project management skills while producing a powerful monument in a medium of their choice. Finally, they have built the skills and knowledge to engage in civic conversations with efficacy and expertise. Not every community’s history will be the center of national attention in the way that Charlottesville’s has over the last 18 months, but every community has its stories, its shared narrative of what kind of place it is. And each of those narratives has its untold stories, those which have been lost or forgotten, ready to be discovered and shared by an intrepid group of students.